The Pudgalavāda or «Personalist» school of Buddhism broke off from the orthodox Sthaviravāda (elders) school around 280 BCE. 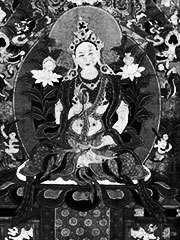 The Sthaviravādins interpreted the doctrine of anatta to mean that, since there is no true «self», all that we think of as a self (i.e., the subject of sentences, the being that transmigrates) is merely the aggregated skandhas. The Pudgalavādins asserted that, while there is no ātman, there is a pudgala or «person», which is neither the same as nor different from the skandhas. They would argue that without such a person, it is impossible to account for karma, rebirth, or nirvana.